Pressure BioSciences (OTCQB: PBIO) acquired the assets of BaroFold, Inc. Among these assets were all patents, equipment, and intellectual property relating to BaroFold’s PreEMT™ high-pressure protein refolding technology. PreEMT is an enabling, patented technology that employs high pressure for the disaggregation and controlled refolding of proteins to their native structures at yields and efficiencies not achievable using existing technologies. PreEMT improves dissolution of protein aggregates, which can significantly impact the quality of protein therapeutics by improving the activity, homogeneity and stability of the protein, while also reducing undesirable immunogenicity. 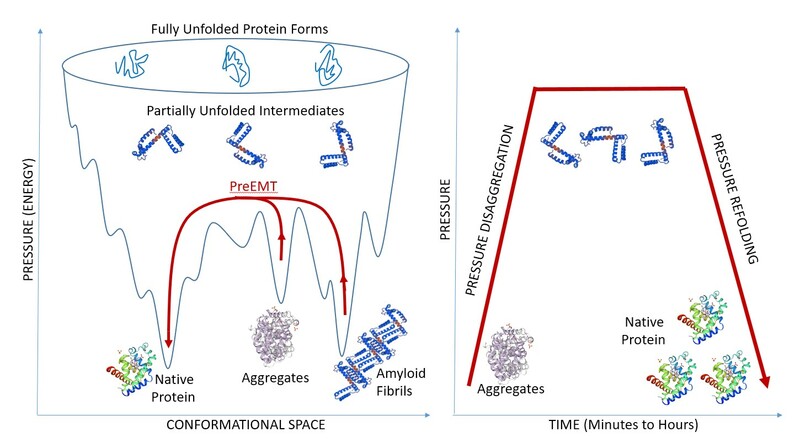 PreEMT technology subjects aggregated proteins and protein inclusion bodies to elevated pressure, which forces water into solvent-excluded cavities within proteins, resulting in protein unfolding and disaggregation. High pressure stabilizes partially unfolded protein forms and prevents them from random re-aggregation. High pressure essentially replaces chaotropic reagents and detergents that are typically employed in chemical refolding protocols. However, unlike chemical denaturation, high pressure-unfolding can be gradually reversed by simply decreasing pressure, eliminating the need for dilution or dialysis. Therefore, in a suitable chemical environment, proteins can refold into their energetically-favorable and stable native conformations. Biologically active native protein is recovered within hours at yields often approaching 100%, even at high protein concentrations. PreEMT technology can be applied to a wide variety of therapeutic proteins, including single polypeptide chains, multimeric protein complexes with and without disulfide bridges, and protein crystals. PreEMT can be utilized in the refolding of recombinant proteins produced in mammalian cells, yeast or E. coli. PreEMT has significant utility in the refolding of recombinant proteins produced in E. coli at high expression levels as inclusion bodies, particularly antibody fragments and toxic proteins. In addition, PreEMT can be used to reduce levels of aggregates in bulk or final formulations of some therapeutic proteins, thus improving product safety profiles by reducing the risk of aggregate-induced immune responses. PreEMT is readily scalable and is practical for the standard manufacturing process of recombinant proteins. Importantly, PreEMT has the potential to substantially reduce the cost of manufacturing due to its increased efficiency and high yield of refolded protein. Pressure BioSciences offers this valuable technology through Contract Services, Novel Research-Scale Instrumentation, and Licensing to help industry partners create new protein therapeutics, accelerate therapeutic protein development, manufacture follow-on biologics, and enable life-cycle management of protein therapeutics.